Once again I am inspired by something I saw on a menu, though this time I didn't order it. Our friend, Jennifer, took Mark and me to dinner at Brix in Flagstaff to celebrate my birthday. The meal was just delicious. We started with fried Brussels sprouts in agrodolce, and a plate of fried oysters. For the main courses, Jennifer had salmon, Mark had the steak frites, and I had a pork chop. Among many other dishes that piqued my interested was the Purple Haze Ravioli. I love Cypress Grove's Purple Haze goat cheese. It is a delicate blend of fresh goat's cheese, lavender, and fennel pollen. The dish sounded fantastic. 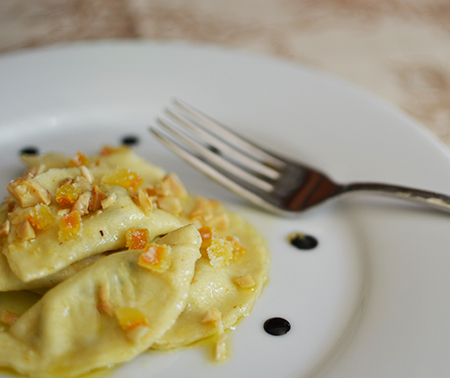 The ravioli are stuffed with the cheese, and served with lavender-rosemary-infused brown butter with Marcona almonds and candied orange peel. What's not to like? I noted the elements of the dish and immediately started planning to make this at home. The real Purple Haze is dusted with the herbs, but I blended mine in. Instead of the garlic added in the restaurant’s version, I opted for a more subtle herb to complement the cheese: finely chopped fresh chives. I also added a little Pecorino Romano and a bit of egg. As I never saw the restaurant’s version of the dish, I have no idea how they shaped their ravioli. Half moons appealed to me. 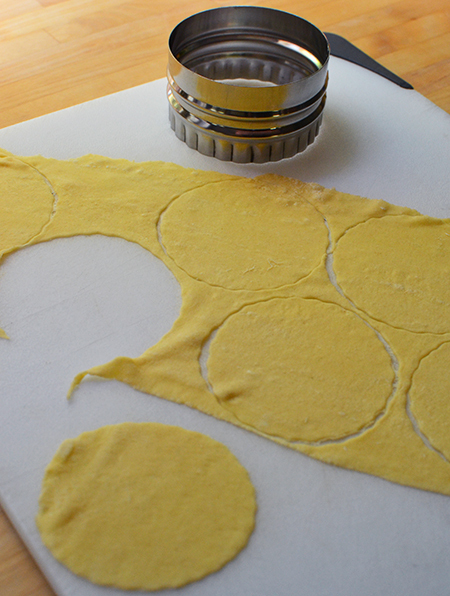 I cut these with a scalloped biscuit cutter my friend Heather brought from London. Nor did I see the restaurant’s plating, so I opted for simplicity. 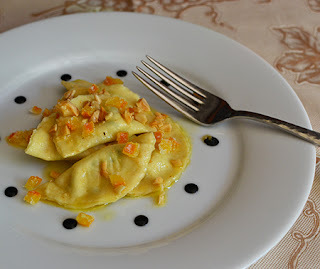 I tossed the ravioli in the herb-infused butter, placed a few on each plate, and topped with the chopped nuts and candied orange peel; I decorated the plates with dots of crema di balsamica. This ends up not being just a decoration, but a nice addition to the flavors of the dish. We had picked up a «vin de table» rosé to test with this. 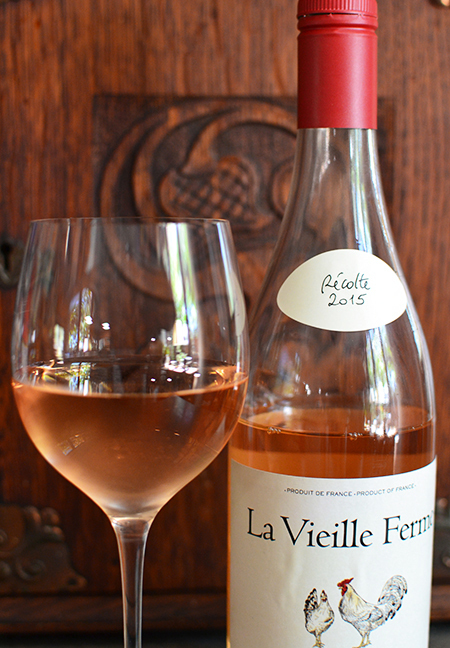 It was La Vieille Ferme - a wine made by the Perrin family in Provence. To read more about the pairing, visit the Provence WineZine. A lovely experiment - and successful! It takes a bit of time, but it's all fun time in the kitchen, and that makes me a happy boy. 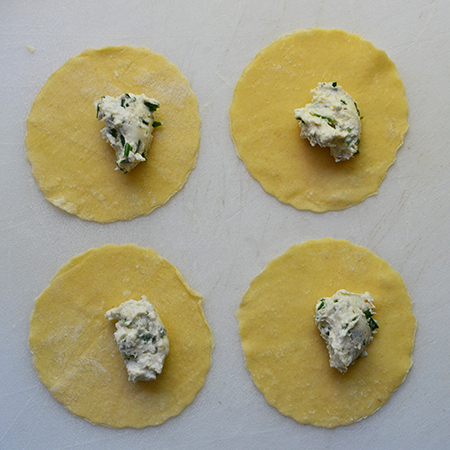 1 1/2 cups flour, type "00"
For the ravioli, first bring the cheese mixture to room temperature. 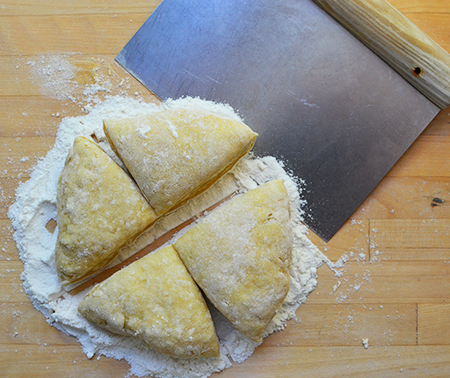 Place the flour on a wooden or stone countertop, and make a well in the center. Add remaining egg (don't scrape the egg bowl, and don't clean the bowl! Set it aside; you will use this residue later). Add a pinch of salt. 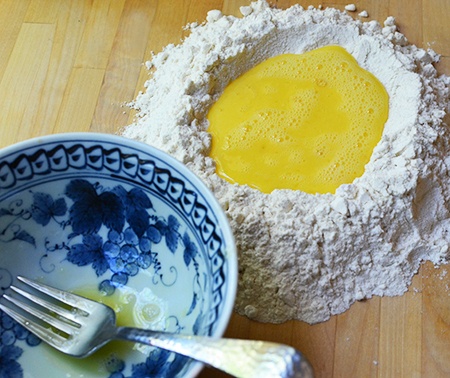 Using a fork - or your fingers - gently stir the egg so that it gathers the flour little by little, until it forms a dough. Most, but not all, of the flour will be absorbed. Knead the dough for a few minutes, then wrap in plastic wrap and let it rest for 20-30 minutes. While dough rests, stir the grated Pecorino Romano and 2 tablespoons of the beaten egg into the cheese mixture. Knead the dough on a floured board a few times then cut into quarters. Start rolling one quarter, while keeping the others tightly wrapped in plastic wrap. Using an Atlas pasta machine, roll out the dough starting at the widest setting, and repeat, working through to setting No. 6. Add flour as necessary to keep dough from sticking to the rollers. From the sheets of pasta, cut out 3-inch circles and set them aside on a flour-dusted surface, covered with a damp cloth or damp paper towel. You will need 30 discs. Extra pasta can be saved for another use. When ready to fill, place 1/2 teaspoon of filling just off center of each disc. 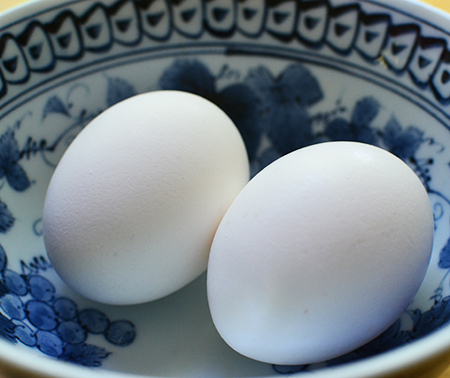 Retrieve the bowl used to beat the eggs and add a tablespoon of water, mixing it with any remaining egg. Using a pastry brush, "paint" along half the outside edge of each disc, then fold the other half over the filling, gently pressing out any air. Then pinch edges tightly with your fingers. Place on a parchment-lined cookie sheet. When all the ravioli are formed, place the cookie sheet in the freezer while you boil the pasta water and make the sauce. Place a large kettle of water on high heat and bring to a boil. Add a fistful of salt after it comes to a boil. Keep at a gentle boil. Melt the butter in a small skillet (don't use a nonstick skillet or you not be able to see when the butter takes on color) and add 2 teaspoons lavender buds plus the rosemary. Press down on the herbs to release their flavor. Cook until the butter turns nutty and light brown. Strain through a fine-mesh sieve? into a large skillet, add the chopped almonds; keep warm. Remove the ravioli from the freezer and slip them gently into the boiling water. Keep the water at a gentle boil, so as not to damage the ravioli. 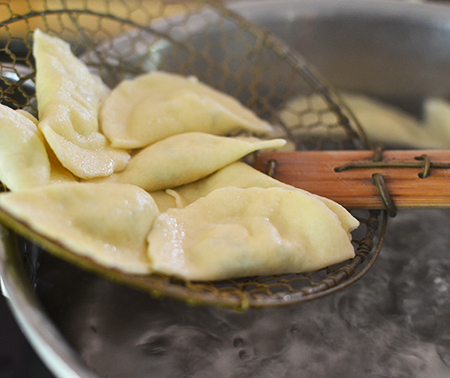 Cook for 3 minutes and remove them from the water with a strainer. Add the ravioli to the brown butter sauce, and toss gently to coat the pasta. Divide among heated plates, spoon remaining browned butter and Marcona almonds over the pasta, and sprinkle with the diced orange peel. Dot the crema di balsamica around the edge of the plate, or be artistic and make a “smear” on one side. Serves 6 as a first course, or 2-3 as a main course. 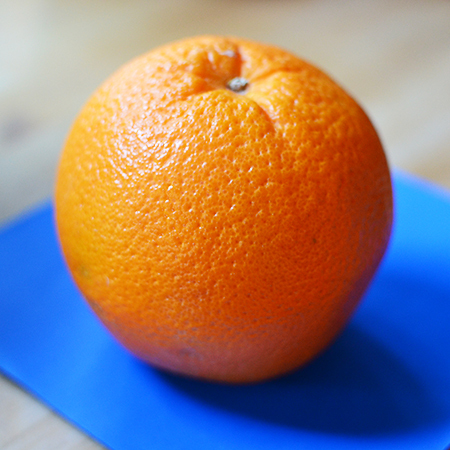 Score the orange in quarters and remove the peel (zest plus pith) and reserve the orange segments for another use. Slice the peel into 1/4-inch long strips and place in a small saucepan. Cover with water and bring to a boil. Drain, cover again with cold water and bring to a boil once more. Drain and place strips on paper towels to drain. In the same saucepan, place 1 1/2 cups sugar and 1/2 cup water. Bring to a simmer and simmer for 9-10 minutes. Add orange peel strips and bring to a gentle simmer. Cook for 45 minutes, or until pith is translucent. Place a sheet of aluminum foil on the counter. Drain the peel strips and place them on the foil. Sprinkle liberally with sugar, toss back and forth on the foil, then continue to sprinkle with additional sugar and toss till strips are well coated. Place strips on a cooling rack. When cool, place in an airtight container. I keep them in the refrigerator. Can be made up to a week in advance. Surplus not used in the recipe makes a pleasant snack. Of course you can come to dinner! You can even bring Mike! 😉 I love Time Market - especially since the renovation. I'm with you, David; a good restaurant can be very inspiring. 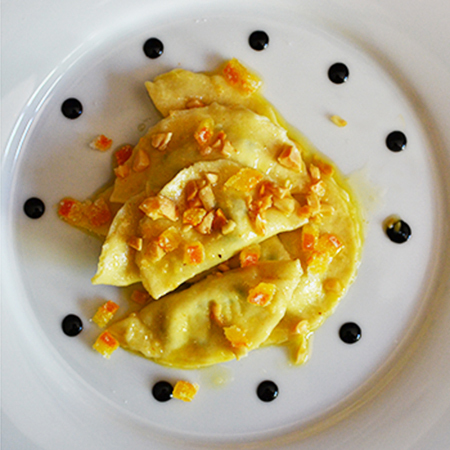 Your ravioli sound delicious, and your photography is mouthwatering as usual! Thanks, Lois! I love creating things I see on menus - I even found once that I liked my version better! I would, indeed, Liz! Now, just make these reservations and hop on over! What a great combination of flavours. It's always great recreating a dish you've eaten or just read on a restaurant menu. Nice one! Thanks, John - lots of fun to make this one! Oh my gosh, what a delicious birthday dinner! This recipe sounds so lovely. I was just given a container of dried lavender, and think it was meant for this. I am really looking forward to what you will do with the lavender, Valentina! Shoot! I spied that very wine the other day when I went in to buy some beer for my hubby. I have to admit that I have often bought wine by Vielle Ferme (although not the rose yet) because I love the chickens on the label! Silly, I know. I will try it next time I go "to town." Also, that recipe sounds just delicious! Hmmm....some day. Thanks, Caterina! Yes, the chickens on the labels have become more and more endearing with better art! Thanks, Marcelle! 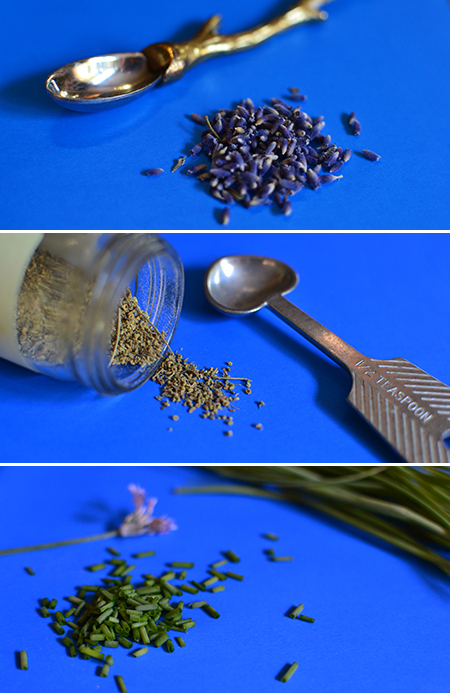 Lavender, when used carefully, adds such a wonderful flavor to both sweet and savory dishes! I couldn't help but notice that set of cookie cutters, with all different sizes. I want one of those! And "mezzelune" may be my favorite form for stuffed pasta. 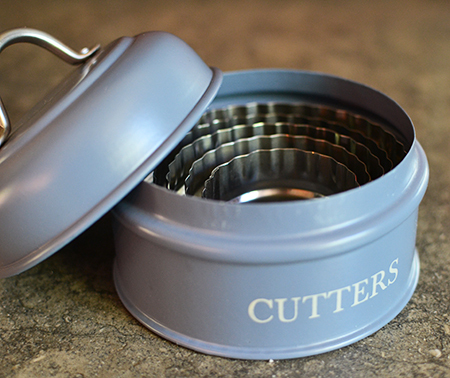 Frank - I wonder if the cutters are available online - my friend got them at Harrod's! I will see what I can find when I am there at the New Year! David, this looks divine. What a great job on reproducing this recipe. I been known to make photos of the restaurant menus. Happy late Birthday. I think takin photos of menus is a great idea, Gerlinde. Thanks for your kind words! What a delicious looking dish--and your plating is perfect. My daughters and I stopped in Flagstaff on the way to the Grand Canyon a few years back and were impressed with the place we ate. Is it a pretty good food town? Inger - while I don't think of Flagstaff as a real foodie town, the scene is pretty good. Definitely go to Brix if you go back. Thanks for your comment about the plating - one friend pointed out that it looks like a clock with only eleven hours! David, this sounds soooo good! I don't usually like lavender in food, probably because most people overdo it, but I'm sure *you* used just the right amount. I'd love to be having this for lunch today! Thanks, Jean - I am very careful to have a light hand with the lavender. You are so right about it being too strong sometimes! Hi David, will have to check out the Time Market next time I go to Tucson, love everything about this dish, the candied orange peel is lovely. Cheri - you will LOVE Time Market. The sandwiches and pizza are great, and they have a wonderful wine, cheese, and gourmet item selection. Hi David, I've still never made my own pasta but this recipe--and the wine pairing--might finally propel me to do it. The symphony of flavors sound exquisite! As always, I am appreciative that you share the recipe and make a wine recommendation for my readers at Provence WineZine! What a beautiful job you did! I rarely make ravioli as my mother makes millions when she visits during the winter! But I've been wanting to make a different version and yours sounds lovely, although I have a thing about lavender after ODing on it at my old house :( Terrible when that happens, so now I can't smell it anymore. 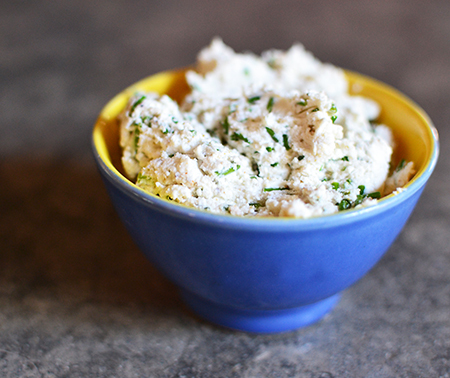 I'm sure I could flavor the goat cheese so many different ways; one of my favorite cheeses! I think this is a problem with many people (I'm going out on a limb here) in the cooking field. If something is good, use it everywhere and with abandon till either you hate it, or everything tastes like everything else. It is hard to hold back when you love something but I think that is the main key to excellence in the kitchen. My big mistake once was making brown butter and sage; if 5 leaves are good, 20 must be better! Definitely not the case. Now, when I read a recipe from a trusted source, I do just what they say. If they say 5 sage leaves, they mean it! Thanks, Strumica! Loved perusing your posts - lovely photos of your travels.